John James Audubon is one of the world's most prolific bird illustrators, an explorer and innovator who paved the way for artists who followed him. It makes sense that he, along with Louis Agassiz Fuertes, would be one of the first artists featured in our Know Your Bird Illustrator series. 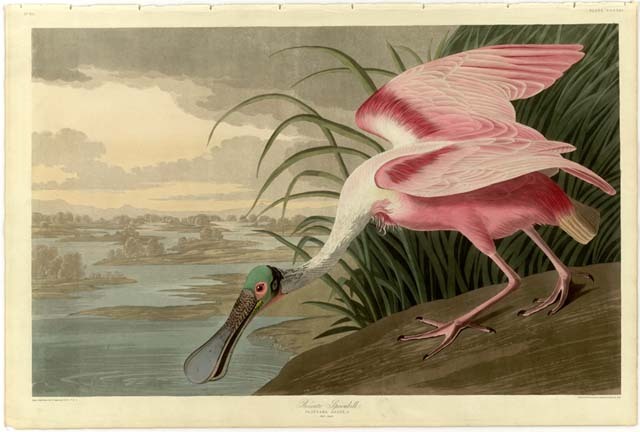 John James Audubon was originally born Jean-Jacques Audubon in the French colony of Saint-Domingue, now modern day Haiti. His father was a French navail officer who owned a sugar plantation; his mother was was a creole chambermaid who died shortly after his birth. Growing up, Audubon became fascinated with birds and would often go off exploring in the woods and documenting his finds. His father wanted him to become a naval officer like himself, but after failing the officer's qualification test in his teens, he went back to doing what he loved most - surrounding himself with nature, watching birds. At age eighteen, Audubon boarded a ship headed for the United States to start a new life for himself. While traveling, he anglicized his name to John James Audubon. After arriving in America, he began studying birds and recording his observations. During this time he became the first known person of his time begin bird-banding by tying yarn to the legs of Eastern Pheobes so he could observe their nesting patterns. In 1808, Audubon met his wife, Lucy Bakewell, and had two sons. Together they started a general store, a venture which ultimately failed. In 1820, Audubon began working on a collection of illustrations, entitled Birds of America. He traveled throughout the United States, illustrating various bird species and receiving drawing and painting lessons from several artists while his wife worked to support their two children. When he finished his book six years later at age 41, Audubon took his collection to England, where it found great success. The book was so popular that even King George IV was a fan. London's Royal Society elected to make Aubuon a fellow for his achievements. Between 1829 and 1839, Audubon traveled back and forth between North America and England to promote his work before finally settling down again in the united States. Audubon died of old age in 1851, having published three books and hundreds of illustrations. His work from Birds of America is displayed at the New York Historical Society, where it remains a national treasurer to nature lovers and artists alike.